Pew’s election team has produced an absolutely gorgeous interactive graphic on voter participation across the country 1990-2010. I HIGHLY recommend clicking and bookmarking the link – and then exploring the data to see trends across the country in registration, ballots cast and votes counted over the last two decades. Pew’s news site Stateline (another site worth bookmarking) has its own infographic using the same data. Kudos to the entire Pew team – election geeks and designers alike – on a fabulous resource for the field. Be the first to comment on "Data IS Beautiful (cont. 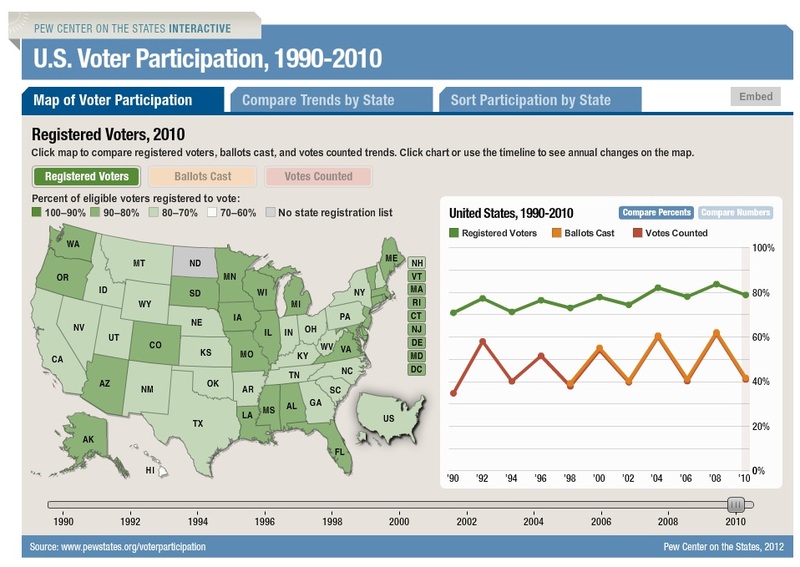 ): New Pew Interactive Graphic on Voter Participation"